In late 2013, Allergan received FDA approval for the newest hyaluronic acid filler on the market – JUVÉDERM VOLUMATM XC (VOLUMA). This is a mid-face hyaluronic filler that’s expected to last two years. Voluma is the latest of the JUVÉDERM® range of hyaluronic acid fillers and is the ONLY FDA-approved filler to restore midface volume loss. It is approved for use in the central cheeks and cheekbone. This is the one and only filler that can be used to create higher cheekbones! According to a leading anti-aging experts, an attractive face is characterized by smooth, round contours, high cheekbones and a thin, well-defined jaw line. These features together comprise the ‘triangle of beauty’ or ‘heart of face’, with its base at the forehead and the peak below at the chin. This is what VOLUMA helps achieve. What is Voluma and what does it do? Created by Allergan, the makers of BOTOX® and JUVÉDERM®, VOLUMA is the first and only FDA-approved filler to instantly add volume to the cheek area. VOLUMA is an injectable hyaluronic acid gel for deep injection in the cheek area to correct age-related volume loss. Hyaluronic acid is a naturally occurring substance in your body that helps to add volume and hydration, and the unique cross-linking of VOLUMA allows it to be a thicker, plumper gel than other hyaluronic acid fillers. Additionally, VOLUMA is unique because it is less hydrophilic than other JUVÉDERM® products, meaning it pulls less water to itself after injection. What does this mean for you? Less swelling! VOLUMA has been shown to last up to two years, when injecting amounts for full correction. 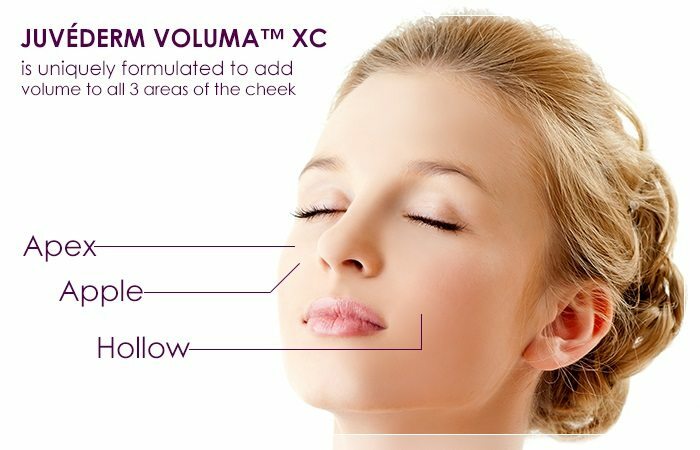 Several years ago, Allergan introduced XC products to their JUVÉDERM® line—now including VOLUMA. These products are the same formulations but with lidocaine already in them. For more information about VOLUMA, including all FDA information and a photo gallery of befores and afters, please visit the Allergan VOLUMA website at www.juvederm.com. VOLUMA is injected under the skin into three main areas of the cheek. The exact placement and amount will depend upon each patient’s volume loss in these areas. Depending upon the site of injection and your specific volume loss, multiple syringes may be needed for full effects. If patients are truly unhappy with a hyaluronic acid filler, the filler itself can be dissolved with the injection of Vitrase/hyaluronidase. Why is Voluma different than other fillers? Like many of the most well-known and well-liked fillers on the market, VOLUMA is made of hyaluronic acid. However, because of its unique cross-linking, VOLUMA is the first and only FDA-approved filler for mid-face volume loss because it is a larger, plumper molecule. Because of this feature, VOLUMA is injected at deeper levels within the skin. VOLUMA also pulls less water to itself after injection, which will result in less swelling. VOLUMA is biosynthetic and of non-animal origin. Since it is not created from an animal source, there is little chance of allergic reaction and no testing is required prior to injection. The formula is highly biocompatible (over its lifespan, it will metabolize with your body). It has been proven to be safe and effective for skin of all types and colors. Depending on your desires and the areas you want injected, Sharon can help you decide if VOLUMA is the right filler for your needs through a consultation. What is the Voluma Treatment like? Sharon will begin by discussing the treatment with you and have you sign a consent for the procedure. She will prep the site with numbing agents to further reduce any pain or discomfort during the procedure and have you wait about 10 minutes. By waiting this amount of time, the blood flow to that area is able to dissipate a bit, resulting in less bruising and swelling. After about 10 minutes, Sharon will administer the VOLUMA syringe and expertly and artistically inject the substance into the areas to be filled and re-volumized. She will then apply ice packs to the injected areas and have you sit for a few minutes to apply pressure, thereby further minimizing swelling and bruising. The full procedure should take approximately 30-45 minutes. You will leave the office having minimal discomfort or other effects and be able to return to normal activities. What kind of results can I expect from a Voluma treatment? You should see an immediate improvement in the treatment areas (normally 1-2 days) with minimal bruising or swelling. Sometimes bruising and swelling can be minimized by taking Arnica pills, using Arnica gel, and/or having Arnica gel pads applied after injections. Arnica is a natural medication that can be obtained from a local health foods store. It is not necessary to take it, but some people find it helpful, particularly if they are prone to bruising. Ice packs and avoidance of aspirin for a few days will help should you encounter either of these as well. VOLUMA will give a subtle lift and help contour the areas to which it’s injected. For most patients, VOLUMA should last up to two years, although in some cases and areas, the duration of the effect may be shorter or longer. Supplemental treatments may be required to achieve and maintain optimal results. VOLUMA will often be combined with other fillers, like JUVÉDERM® for the nasolabial folds or Restylane® for the tear troughs and lips. If you get VOLUMA regularly, make sure you sign up for Allergan’s Brilliant Distinctions program. By participating in this program you get points for each treatment which you can then deposit and redeem for discounts on future treatments and products from Allergan. For all of the details, please check out www.brilliantdistinctionsprogram.com.